Starbucks will be moving into the space formerly occupied by Gallo’s Restaurant in the Walgreen’s Shopping Center in east Los Gatos, at the corner of Blossom Hill and Harwood Roads, probably in October or close to that time. The popular coffee shop will take up about two-thirds of the building, the part closest to Blossom Hill Road, with the remainder likely turning into a Subway sandwich shop. Right now there is no space for outside dining, but the plan is to rework some of the landscaping so that this can be incorporated. The patio and tables will be a hit not just for those who like the outdoors, but for the many Belwood, Belgatos, Surmont and nearby neighbors who will walk over to the establishment with pooches in tow. This should be a very nice enhancement for neighbors, who right now do not have anyplace in walking distance which offers patio dining of any kind. C’mon, Los Gatos: let’s be good neighbors and make sure that our pets are good neighbors, too. On top of that, having your animals eliminate on other’s yards is actually against the law. Sec. 4.10.020. – Animals running at large – chapter 4, article 1, item 4. No person owning or having control of any animal shall permit such animal to stray or run at large upon any public street or other public place, or upon any private place or property or common area of any planned development, cluster, townhouse or condominium project, without the consent of the owner or person in control thereof. Sec. 4.10.070. – Public nuisance – chapter 4, article artile one, item 14 . (4) Permit unsanitary conditions to exist on the premises where that animal is kept that would cause odors, attract flies or vermin, or otherwise be injurious to public health and safety, or be indecent, or offensive to the senses, or be such an obstruction to the free use of property so as to interfere with the comfortable enjoyment of life or property by other persons. (b) The animal control officer may seize and impound any animal causing or creating a public nuisance. (c) A violation of this section is hereby declared to be a public nuisance. (d) Any private person may maintain an action under Civil Code section 3493 for enforcement of this section declaring certain acts a public nuisance, if such acts are specifically injurious to that person. At the meeting described below, several residents complained that Bacigalupi Drive is the worst for speeders – possibly because it is so wide near Harwood Road. Yesterday an electronic device was placed in this stretch of the road which displays how fast cars are travelling. It would be great if this slowed traffic down – thank you, Town of Los Gatos!! Until tonight, I’d never been to a traffic calming meeting. It was anything but “calm”! Los Gatos Parks and Public Works Director Todd Capurso did a great job running the gathering despite strong feelings and loud voices. Since ONE of the previously proposed solutions was to partially barricade Belwood Gateway at Harwood and that would impact nearby streets, those of us in the “impacted areas” were invited to tonight’s meeting. My family and I live on Bacigalupi Drive and we would definitely be impacted if that road were blocked, so I was made aware of this ongoing process recently. Todd patiently recounted the chronology of events leading to tonight’s meeting and explained, over and over, that at this meeting a solution was not going to be decided, but instead what would be firmed up was simply what residents would vote on in the future. Belwood Gateway residents would be able to vote on adding a stop sign and speed bumps. Nearby neighbors would be allowed to vote on whether or not a “triangle” could be placed at the intersection of Harwood and Belwood Gateway. The meeting began at 6:30 and was scheduled to end at 8pm. At 8:05 the crowd was beginning to leave and many who remained began to speak so loudly that Todd could not hear questions being posed (nor answer without having to yell). It was dissolving. I left at that point. It was nice to see so many neighbors (whom I normally see only while out walking our black lab, Bella) and to learn what the process is for requesting that traffic patterns be evaluated by the town and local residents. Now we wait for the ballots – it will probably take a month or two for them to be created and mailed out. As for me, I’m all for more speed bumps and stop signs, but I hope that they don’t block off part of that one road…it will, in my opinion, only encourage drivers to take alternate routes. I’d love to see traffic calmed throughout Belwood, Belgatos and Surmont. If only civilians could give tickets! A rumor has been circulating in the Belwood – Belgatos – Surmont area about a mountain lion death earlier this week in or near Belgatos Park. It’s been confirmed that a mountain lion was killed on Monday evening by a Belgatos resident. The mountain lion had killed multiple animals or livestock on the resident’s property so the owner sought and received a permit to kill it from the state fish & game department. This apparently happened on private property, most likely close to the park. 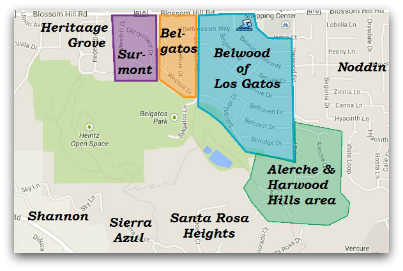 I just updated my Belwood of Los Gatos website with what has closed in the last three years in that part of town (including the Surmont and Belgatos areas). At the top of the page is a live mls-searching map which shows what’s available in that area. Right now there’s just a duplex for sale there, no houses whatsoever! Scroll down to see first sales in 2009, then 2008, and finally 2007. Some of the numbers are disturbingly low (disturbing if you are a homeowner). Some of the lowest prices have been homes which were distressed sales (short sale or foreclosure) or which were not well staged and easily accessible. Hard to see, cluttered, unstaged homes simply sell for a lot less than homes which are well presented and easily viewed. In 2009 we saw a rise in foreclosure activity in and near Belwood. This may keep up for a couple more years until the current mortgage crisis is cleaned out. This park is unique for a Town of Los Gatos park in many regards. First, it is one of the only parks in town which can accomodate horses, joggers and mountain bikers. (Joggers and mountain bikers, don’t zone out! Horses may have gone before you.) Second, in addition to the niceties of a larger park, which include several grassy meadows, a playground, and a restroom, there are a myriad of trails that interconnect with Belgatos. If you are so inclined, you can spend hours chasing down the paths that wind through the Sierra Azule foothills. Finally, it is one of the only town parks which, with a little effort on the visitor’s part, can provide stunning valley views. With that introduction, I’ll share with you some video clips I took recently. It’s now the end of summer and Silicon Valley is dry and so are our parks. 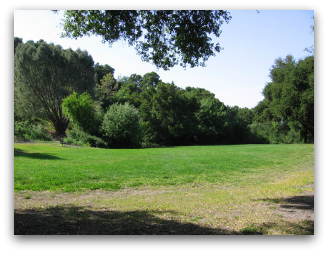 Below the video clip I will include other pics, from other seasons, of our beautiful Belgatos Park in Los Gatos. 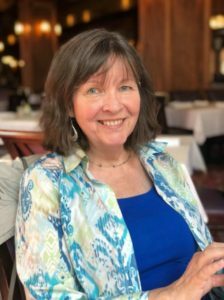 Here’s a link to a prior post about Belgatos Park in this Live in Los Gatos blog: A Hike and a Photo Tour Through Belgatos Park. 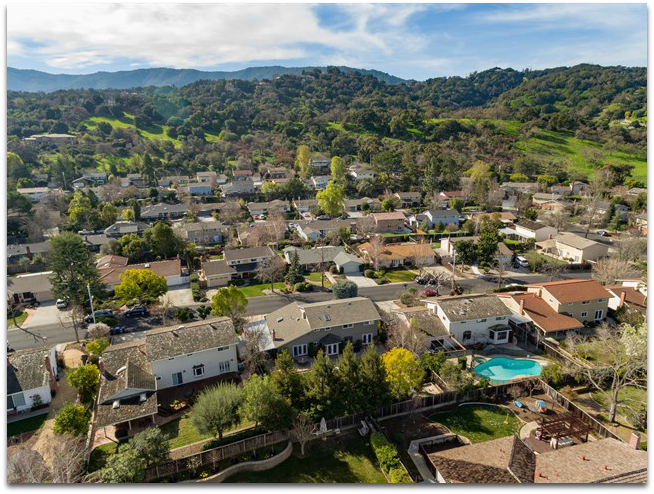 And here’s a slideshow of Belgatos Park done through Real Estate Shows. I took the photos of Belgatos Park in spring, so it’s all very, very green and lush.